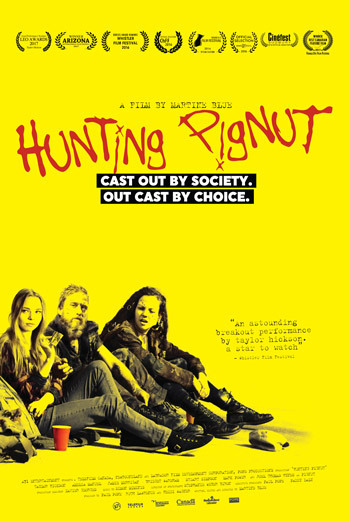 HUNTING PIGNUT centers on Bernice (Taylor Hickson), a 15-year-old who hates her life in the tiny, isolated community of Black Gut, Newfoundland. She feels she will never overcome the trauma that has left her body and psyche deeply scarred. Her dejected spirit takes a strange turn when her dad dies of a heroin overdose and Pignut (Joel Thomas Hynes), a charismatic but tormented gutter punk, shows up for his wake. When Pignut steals her father’s ashes right out of the urn, Bernice embarks on an odyssey to hunt down her father’s remains and to discover her place in his heart and in the world. Look for a cameo appearance by Mary Walsh in this indie feature. Consumer Advice:(BC) Coarse language, drug use. (AB) Coarse language, substance abuse. (MB) Coarse language, substance/alcohol abuse.